Chicago Public Schools's mural collection is a canvas for learning. When a former teacher at Chicago's Lane Technical High School noticed that a mural at her school was falling out of its frame and badly in need of repair, she hadn't yet grasped the picture's significance. But spurred by her interest in saving one painting, Flora Doody soon discovered that scattered throughout the city and hidden underneath three-quarters of a century of grime -- and, in some cases, a layer or two of paint -- lay one of the largest collections of Progressive Era and New Deal murals in the United States. Until she managed to help launch a movement in 1995 to locate and restore a neglected trove of historic art at Chicago Public Schools (CPS) campuses, as many as 440 murals and smaller paintings had been gathering dust in school hallways, libraries, and auditoriums, often crumbling, obscured by grit, stuffed in closets, or forgotten in boiler rooms. Those pictures, created between 1904 and 1943 to enrich the lives of Chicago's schoolchildren, are found throughout the city's public schools, sometimes more than 60 in a single building. Painted by gifted and sometimes famous artists such as James Edwin McBurney and Gustave Adolph Brand, they depict the city's origins, its role in the industrial revolution, prominent historical figures, even folklore. Many were commissioned as part of the Works Progress Administration's Federal Art Project, the New Deal program that gave artists jobs during the Depression and brought art to public schools, post offices, and other public spaces throughout the United States. Only a committed band of enterprising teachers, administrators, curators, and conservators could have brought to light the hidden collection and begun the exacting process of restoration, while making the project a significant part of the CPS curriculum. "The history of the CPS art collection is in many ways the history of the last century of the Chicago public school system," says Robert Eskridge, executive director of museum education at the Art Institute of Chicago and one of the key players in the collection's revival. Past and present leaders in public education, government, and philanthropy joined forces to both create and rekindle the artwork's original intention: to both inspire and instruct. Thanks to Flora Doody and this dedicated group, the CPS's Mural Restoration Project came into being. Among the key members are former Lane Technical High School principal David Schlichting, Barry Bauman and Heather Becker of the Chicago Conservation Center, Lane Tech students, faculty, and local historians. Funders include the Polk Bros. Foundation, the MetLife Foundation, the Field Foundation of Illinois, the Richard H. Driehaus Foundation, the Public Building Commission of Chicago, and the Chicago Board of Education. "This artwork is at once socially, artistically, and historically significant," says Peter Shoenmann, head conservator of paintings and murals at Chicago's Parma Conservation, which restored roughly a third of the collection between 2000 and 2002. "It's easy for a student to take it for granted as decoration, but it has a lot more to it." The mural-conservation process -- now nearly complete pending additional funding -- took place at school sites and in conservation laboratories, allowing CPS students to inquire about the historical significance of the work and the science of conservation. by Janet Laura Scott, 1911, at Tilton Elementary School, was covered with several layers of oil-based paint (top) before conservators restored it with a scalpel and solvents (bottom). Typically, says Peter Schoenmann, kids stood in awe as he carefully wiped away decades of dirt. "They couldn't believe the colors that were coming through were actually there," he says. "A lot of times the first thing out of their mouths was, 'That's beautiful! How long did it take you to do that?'" But, he emphasized to the inquisitive onlookers, "We're not artists. We're more like technicians." This often came as a surprise to the students, who didn't expect to learn much about chemistry while gazing at a work of art. Painting conservation and restoration turned out to be an ideal subject of study for science class. For instance, Schoenmann explains, microscopic particulates in the air will form hydrogen bonds with a painting's surface so that "no amount of water or scrubbing will be able to remove that dirt. We had a whole laboratory set up at Parma so that students could do small experiments, such as observing what the pH in a solution does when you put it on a surface, and why that's so important." "When I was in chemistry in high school and we studied pH, it meant nothing to me," he adds, "but now I use it" -- a fact Schoenmann emphasized to the kids. "A lot of the students even saw conservation as a pretty cool profession, something they could possibly do themselves one day." The mural collection has opened other ways of thinking for students as well. Through the "Chicago: The City in Art, 1995-2000" curriculum developed by the Art Institute of Chicago in partnership with CPS, students used the murals as jumping-off points for American and Chicago history, art history, and music history. Thought-provoking discussions took place about the cultural implications in many of the murals. 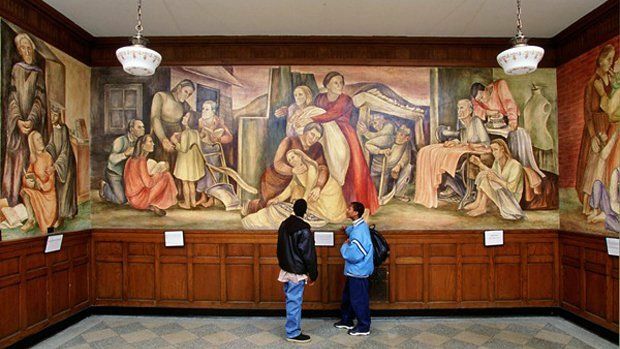 At the former Lucy Flower Career Academy High School (now the Al Raby Career Academy), for instance, a 1940 fresco depicting influential American women had been painted over shortly after its creation due to a disapproving -- and all-male -- Board of Education committee. Since 1995, students have written essays and stories, created their own artwork, developed mural databases, penned and performed historical plays based on the murals, and more. At Lane Tech, which houses 66 murals and 2 cast-stone fountain figures, students train to become docents of the school's collection, leading tours of the school for members of the community. When teachers and students explore the array of educational angles within a single work of art, notes the Art Institute's Robert Eskridge, "all of a sudden you have this interdisciplinary challenge that doesn't fit neatly into this class period followed by that one, and the idea of 'teamwork' isn't relegated to after school." 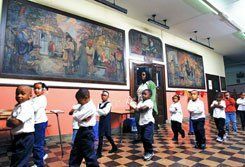 Students at Parkside Community Academy Elementary School stride past such historic artwork as American Scenes, painted by Hubert C. Ropp in 1920. When the Art Institute of Chicago bowed out of the curriculum portion of the restoration project in 2000, public school staffers took over and by 2002 developed the CPS Mural Curriculum. Today, the Rediscovering Chicago Public Schools's Murals Project, headed by Nancy Cortes, the Office of Arts Education CPS's visual arts curriculum supervisor, updates the 2002 guide with new activities, lesson plans, and strategies for educators, such as how to analyze art through a jigsaw method or how to use theater as a way to explore narrative in a mural. Thanks to a grant from the Terra Foundation for American Art, the guide was produced in anticipation of a new exhibit at the Chicago Cultural Center called Hidden Treasures: The Lane Tech Murals, featuring eleven Progressive Era murals (through March 1, 2009). Cortes hopes to attract the attention of all CPS teachers and students, not just those who have murals inside their schools. The process of seeing the murals come to life, and studying both artistry and history, is a boon for all students. But for some, it can be a life-changing experience. "Art reaches a segment of children who have not found their way in another specialty," says Chicago Conservation Center CEO Heather Becker. "If we can help those kids to find themselves in any way possible, then we've helped this generation get that much further along in how they will eventually contribute to society." Sara Bernard is a former staff writer and multimedia producer for Edutopia.